In a recent survey, readers of the Reduce Footprints blog said that the toughest challenges in green living are reducing the use of the car and reducing meat in our diet. I totally get that: Like with most people, my mouth starts to water when I catch the smell of a nice steak on the grill (why, even writing about it gets it going). And the car is so convenient. Besides, even if you tried you couldn't get away from it, since many of us live in suburbs or small towns where you don't get anything done (work, play, groceries) without a car. But while biological imperative and the pressures exerted by an inherited infrastructure can be strong, that doesn't mean that we have to let go all the brakes and jump in our SUVs to drive to the nearest steakhouse. We can put up a resistance. Ah, you say, the spirit is willing but the flesh is weak. I get that too: personally, I particularly shine at energy conservation when we're talking about physical energy that my body has to exert. On cold or rainy days that car really beckons to me. So I need a motivation that's stronger than the objections my wily self can put up (and she is wily, my evil twin). One such motivation is that the green way also tends to be the frugal way, almost always in the long term, and often also with immediate effect. Who doesn't like some money savings? 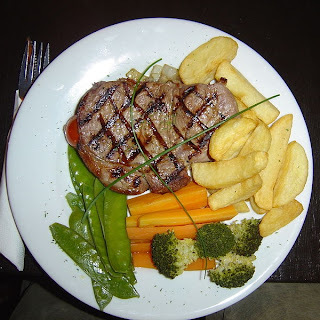 Even if you could ignore the 27 lbs of carbon dioxide emitted for every pound of beef: boneless sirloin steak costs about $7 per pound (numbers from the Bureau of Labor Statistics); indeed the price of beef in general has been rising this past year. In fact, the price hikes have meat producers worried that beef will once again become a luxury food. Aha! those are the magic words: "luxury foods". Because a dozen large eggs (1.7 lbs total) costs about $2. A pound of dried beans is $2. A pound of tofu is about $1. All of these alternatives have a much smaller per-pound carbon footprint than beef, e.g. 1.9 lbs CO2 for a pound of dried beans. If I make baked beans with eggs and a side of kale, I spend $8 total to feed my family for two dinners. If I serve steak, the $7 for the pound of sirloin would just be the beginning for a single meal. And that's for conventional sirloin, highly likely to be CAFO meat. Apart from cost and carbon, eating low on the food chain is good for you on many levels, so you save on health care costs in the long run. So rather than going meatless once a week, my family does the opposite: we eat meat once a week (except ViolaPlayer, who has gone pescatarian). The savings on reduced meat purchases allow us to upgrade to organic fruits and vegetables. Now that summer is on, my CSA delivers, for less than $20 a week, a bounty of organic vegetables, enough to feed my family of four, plus extra to share with friends and to preserve for the winter. I do have to drive a bit to get to my CSA farm, since half the share consists of pick-your-own crops (which cuts the cost and is intensely pleasurable). And that gets me to the car. Living in the US it's easy to forget this, because cars are so ubiquitous and so cheap, but in many parts of the world the car is still a luxury item. Even here, where we think of the car as a necessity, we spend on average as much time actually driving the car, as working to be able to afford driving the car: 10 hours a week. If you work 40 hours a week, this means that all of your Monday, plus part of Tuesday morning, you're working just for your car. That's a lot of time! Since for many of us time is the ultimate luxury, perhaps the car is still a luxury item after all. Even money-wise, it's far from inexpensive, especially now the price of gas is nearing $4 per gallon again. Each car has its own operating cost, but as a ballpark number you can use 56.5 cents per mile, the standard Federal mileage rate for 2013 for the use of a car for business purposes. This is in line with the per-mile cost to drive a car as estimated by Consumer Reports. So if you drive to your local library, say 3 miles from your house, that's $3.39 for the round trip, plus any parking fees. This is why I pay the $0.10 a day late fee on a book rather than making a special car trip to the library for it. (When the roads are clear I just bike: that's zero for fuel and zero for parking, and it keeps me healthier and happier). If you commute to work five days a week (250 days a year), every 10 miles you live farther away from work costs an extra $0.565 * 10 * 2 *250 = $ 2,825 per year. If you are one of those "super-commuters" that do 50 miles or more each way, you're spending at least $14,000 a year just to get to work: all I can say is, that job had better be worth it! 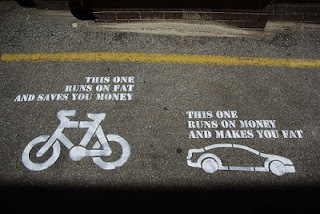 The half dollar per mile and the carbon emissions have conspired to turn me into a real mile-miser: I skimp on miles the way other people might skimp on calories. (Me, I need those calories for biking to my in-town errands). CelloPlayer is part of a three-family rideshare scheme for the school commute. ViolaPlayer walks to the high school now, and is thereby released from the tyranny of the back seat. Since CelloDad telecommutes, we're a one-car family, and I can declare a car-free day once a week - more if I'm really smart about scheduling my car-borne errands. All these strategies add up to a bundle of savings every year. One very effective tool to cut down on unnecessary miles is keeping track of the miles you don't drive, because you become very mindful. Keep a paper sheet (or a spreadsheet) on which you log the miles you've avoided driving by your creative strategies, such as bundling errands, ridesharing, or substituting ingredients in cooking (so you avoid driving to the store for half a cup of rice). Remind yourself that every mile not driven saves 56.5 cents, as well as one pound of carbon dioxide if your car gets 20 mpg. Do this for a week and see the savings add up. (Actually, this was another challenge at Reduced Footprints). Our planet will be grateful for every pound of CO2 you don't emit. And the money savings over time can be substantial. Here is one place where I re-direct some of that money: I do a regular milk run, on which I pick up organic raw milk for four families (saving miles for my friends). My milk farmer also sells grass-fed organic beef, and free-range organic chicken. That's where our weekly meat meal comes from. Hey, if your meat dinner is a once-a-week luxury treat, let it be the good stuff. Inspired by Reduce Footprints' Change The World Wednesday. Shared at Frugal Days, Sustainable Ways, Simply Natural Saturdays, and Natural Living Monday. Thank you for sharing! You present excellent points (as always).